The final closure of Dawn ‘Leaks’ affair was preceded by three meetings of Prime Minister Nawaz Sharif, which news reports claimed were related to the Dawn ‘Leaks’ affair and the April 29, 2017 DG ISPR Tweet. On May 04, 2017, Prime Minister Nawaz Sharif and Chief of Army Staff Gen. Qamar Jawed Bajwa held a meeting according to news reports, five days after the ISPR Tweet. Reportedly, the meeting was held in ‘a pleasant atmosphere’ with border and security situation coming under discussion in it. Importantly, General Bajwa discussed the army’s reservations over the actions contained in the April 29, 2017 PMO letter and Prime Minister Sharif promised to take into consideration those reservations. It is important to note that this meeting was not followed by a press release either by the Prime Minister Office or the ISPR. 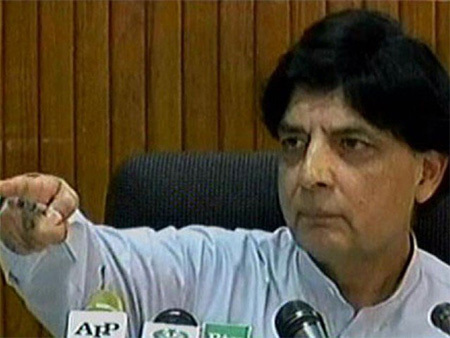 On May 06, 2017, there was a meeting of Prime Minister Nawaz Sharif and Interior Minister Chaudhry Nisar in which, reportedly, the draft notification on the recommendations of the inquiry committee on Dawn ‘Leaks’ was discussed that was to be issued by the Interior Ministry. News reports quoted another meeting of the Prime Minister with his close aides on May 09, 2017 in order to discuss the topic of Dawn ‘Leaks.’  Reports emerged that in the meeting it was decided that the Prime Minister Office notification issued on the matter was sufficient and did not leave any subject unaddressed. 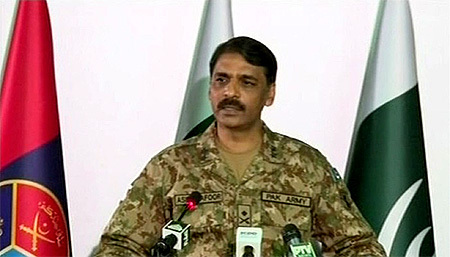 PILDAT believes the withdrawal of the Tweet by the ISPR is a step in the right direction. PILDAT had earlier termed the DG ISPPR tweet as inappropriate in terms of the Constitution of Pakistan and had recommend that a meeting of the National Security Committee should be convened urgently to repair the damage to Civil Military Relations and to the image of the elected Government and its valiant Armed Forces. 1. The use of the word ‘rejected’ and the manner in which the Tweet was phrased was inappropriate. Moreover, the Pakistan Army’s public rejection of the letter issued by the Prime Minister’s Office will only go on to reinforce the image, already held in certain sections of the international community, that the Armed forces of Pakistan are free from civilian oversight. Hence, in the larger interest of the country and to further avoid harming the state of relations between the civilian institutions and the armed forces, the ISPR Tweet of April 29, 2017 should at least be withdrawn or a part of the Tweet should be revised in its wording. 2. The rules governing cyber space should be similar to those governing print and electronic media. 3. Those institutions that traditionally have expertise to deal with print and electronic media may not have the requisite expertise to deal with social media, which may result in excesses on their part when dealing with the latter. Keeping in mind the growth of social media and the issues arising as a result of it, efforts should be made expeditiously for enhancing the capacity of investigation agencies and prosecution services to effectively deal with cases involving abuse of social media. 4. Defamation laws in Pakistan are weak and as a result, defamatory material gets published against private individuals. The difficulty inherent in getting effective relief from the defamation laws in the country can be understood in comparison to the speedy manner with which a court in the UK convicted ARY of 24 defamatory claims against Mr. Mir Shakil ur Rehman, the owner of Jang newsgroup and Geo television. The court delivered its verdict over the same content that was broadcasted in Pakistan, however any action on the same issue is still awaited in Pakistan. 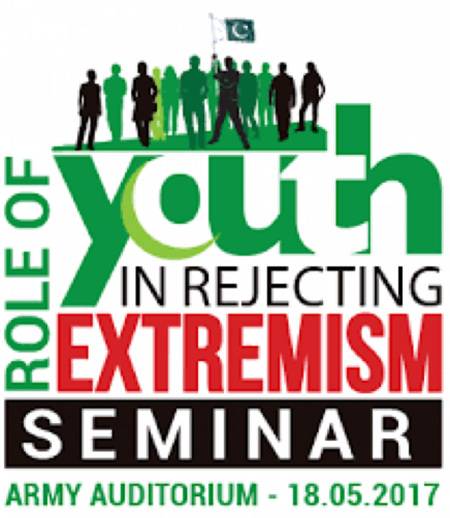 PILDAT believes that while there may be a need for such seminars given the radicalization of certain segments of Pakistani society, it remains unclear as to how the ISPR or the Military’s General Headquarters are suitable organisers and venue to hold such a seminar. The very challenges posed to the Pakistani State and Society at the hands of extremism and terrorism form part of the core responsibilities of the Armed Forces in addition to other professional duties. If the Armed Forces begin to spend their energy and resources on such activities, this would be at the expense of their core role of ensuring the security of Pakistan. There are no shortage of challenges that the Armed Forces are required to tackle and with CPEC security undertaken by the Army, just the recent kidnapping of two Chinese nationals from Quetta should be the cause of concern. Pakistan’s history is replete with references where the Armed Forces have taken on such responsibilities that lie outside their core area of work. This state of affairs may be because of lack of initiative by the civil administration. 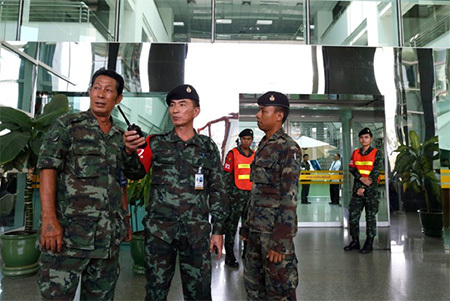 If that is the case, then not only is this an embarrassing situation for the civil administration but it also discourages it from doing its work by giving the impression that the Army is taking care of it. Why could the Ministry of Education and Training not organize this seminar? The GHQ is not a suitable place for conducting such seminars, as they should be happening in universities and public places. It is perplexing as to why the military felt the need to mention FATA reforms and Balochistan reconciliation when policy making and implementation is the domain of elected civil Government. 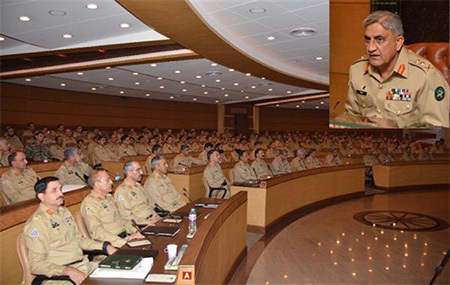 The Formation Commanders Conference must have a full agenda of subjects to be discussed within the professional domain of the institution of Military itself. The growing tendency to publicly offer commentary on policy issues by the Army continues to give the impression as if a parallel cabinet exists in addition to the civilian elected Government which must announce its views on policies. While certain policies may come under discussion as these relate to defence and security and counter-terrorism measures, it makes little sense to offer public commentary on those policies. Any discussion on policies that affect defence and security must be discussed at the proper institutional channels such as the NSC. While the convening of the NSC meeting must be welcomed despite inordinate delay, it is important to emphasize that NSC should meet regularly in view of the defence and security challenges facing the country. Since 2013 when NSC was first established, the body has met on average every 6 months while a similar body, the National Security Council of the UK, for example, meets on weekly basis. 1. The first meeting took place on May 04, 2017 to reportedly discuss the Dawn ‘Leaks’ affair. This meeting was largely reported by the media but not announced through a press release either by the Prime Minister Office or the ISPR. 2. The second meeting took place on May 31, 2017 before the National Security Committee meeting. According to the press release issued by the Prime Minister Office, this was a call-on meeting by General Bajwa. Following the resignation of National Security Adviser Michael T. Flynn on February 13, 2017 for giving ‘incomplete information’ to Vice President Mike Pence and other top White House officials on the matter of his telephone call with Russian Ambassador Sergey I. Kislayk in December 2016,  President of the United States, Donald Trump on February 20, 2017 appointed an active duty General, Lt. Gen. H.R. 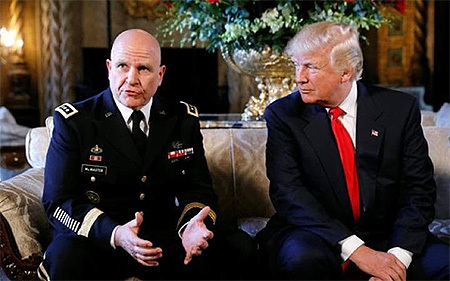 McMaster as his new National Security Adviser.